Deadline to enter: Extended to Sunday, April 15, 2018. Number of poems: Submit up to 3. Cost to enter: 1 poem, free. 2 poems, $3 CAD. 3 poems, $5 CAD. Submissions are welcome from everywhere on Earth. Number of Winning Poems: 2. Prizes: 1st place, $50 CAD. 2nd place, $20 CAD. Intended Publication date: Fall 2018. Please read the guidelines carefully before making your submission. access all contest winners in the Archives. All participants will be added to the email list. Unsubscribe any time. poem(s) may not be submitted elsewhere for the duration of the contest. Facebook post, is not considered as published. Up to 3 poems may be submitted. 1 poem may be submitted for free. 2 poems may be submitted for $3 CAD. PayPal, using the buttons shown, or by cheque, as described below. social media contact information to share, if applicable. State your age. You must be under 25 at the time of your submission. -Payment (if submitting more than 1 poem). -Biography (100 words, or fewer). -Age: Your age at the time of submission. street name, city, province / state, country, and postal code). Entries must be received by midnight of Sunday, April 15, 2018.
include any part of your submission in a document or attachment. 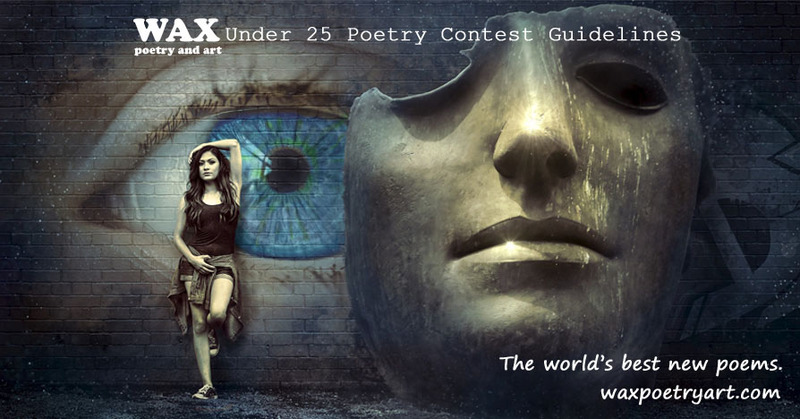 Use the subject header, "Under 25 Poetry Contest". Send your submission by email to info@waxpoetryart.com. Copyright remains with the original artist at all times. the winners. Cash prizes are considered advances on future royalties. + Entry into the World's Best Poem Contest. +1 free copy of the Official Print Version of their poem. (preferred), or cheque sent via regular post, or other method as necessary. page of Wax Poetry and Art, with publication intended Fall 2018.
the title of World's Best Poem. three months following the close of the contest. of the poem, as determined by the editor. Please edit carefully. especially in regards to copyright violations. Questions or comments? Please email info@waxpoetryart.com. of Love in a Handful of Dust. possible locations on earth. Read complete details on the Subscribe page.